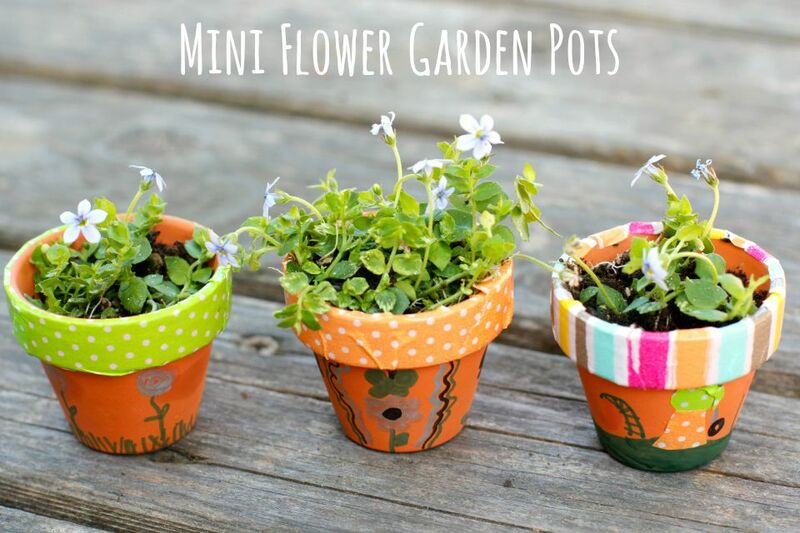 How sweet and adorable are these mini flower pots? You can have so much fun making these. Decorate them with washi tape and markers, then add in a few small flowers. This is the perfect craft for spring and summer and a great way to encourage your kids to help in the garden. Start by decorating your flower pots. We used washi tape to add color and pattern. You can create stripes or tape it all around–anything you want! There are all sorts of fun ways to use washi tape to decorate your mini flower pots! Here's an example of how you can wrap a strand of tape around the rim of the pot. Next, add markers to your flower pots. We decorated with flowers and fun mini designs. Using permanent markers will help the color stay on the pot even if it gets wet from the plant. Finish up your flower pot decorations by adding any extra washi tape or marker designs to your pots. Now that your pots are decorated, you can plant your flowers. Add some soil to your pots. Break off a small piece of your plant and place into the soil. Press them down so they are filled all in. These mini flower pots are ready for a little watering, but not too much! You can over water them very easily so you have to be careful. Your mini planters are now ready to display! Place the pots indoors on top of a small clay pot liner or you can leave them out on your porch or in a small garden. Set up a fairy garden in your backyard if you don't have one already. Your kids will really love this magical idea. Add in little gnomes and figurines or make more fairy crafts!